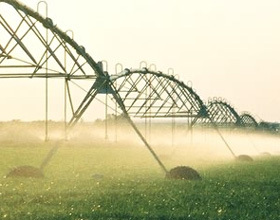 The sprinkler package is one of the most important components on a center Pivot since it must apply the water to the crop uniformly. However, the sprinklers and the maintenance associated with that package are often ignored and not checked. Inspecting sprinkler package on a regular basis is as important as the proper maintenance of any other equipment on the Pivot, for example, the drive train components. A sprinkler package must be properly designed. There are many factors that go into a proper design to ensure good distribution of water and to prevent excessive runoff. Some of these factors include field slope, soil texture, crop canopy height, sprinkler pressure, sprinkler spacing and sprinkler type. It is also important to consider management (how the package will be used during the growing season). Once the design is completed and installed in the machine, it is important to make the following checks concerning the sprinkler package. The small investment in time this takes can pay big dividends by preventing reductions in crop yields. This list of checks should be made at least annually, and some should be performed several times during the growing season. Checking for adequate pressure ensuring that sprinklers are operating at the correct pressure is one of the most important checks. The correct sprinkler chart. An accurate pressure gauge (or make sure that the one installed is working properly). Check the pressure at the pivot point and compare it to the value on the sprinkler chart. The pivot pressure must be measured at the top of the pivot elbow as this is the standard in the industry and can then be compared to the chart value. The actual pressure at the elbow should be equal to or greater than the chart value. There’s also to check the pressure at a location just before the last sprinkler at the end of the machine. For both of these checks, the last drive unit should be located at the highest point of elevation in the field. All sprinklers should be running, including the end gun. If the Pivot has a corner arm, it should be fully extended and at the highest point in the field with the end gun on. End pressure is measured just before the inlet to the last sprinkler on the machine. The measured value should be equal to or greater than the pressure identified on the chart at that sprinkler location. If the Pivot is equipped with pressure regulators, the measured pressure should be at least 5 PSI higher than the regulator rating. (Example: A 15 PSI regulator should have at least 20 PSI applied at the inlet of the regulator). If the Pivot/corner is designed to operate at 20 PSI at the end of the machine and it is only operating at 15 PSI, there will be at least a 15 % reduction in water applied. Pumping conditions can change throughout the growing season. Therefore, pressure checks must be performed at least once a month. Examine the sprinkler overlap and make sure it is sufficient. The outer edge of throw of a sprinkler should reach to the adjacent sprinkler as minimum. Check for any plugged or missing sprinklers. Prior to start up, verify that the sprinklers are placed in the right locations with the appropriate nozzle size. The sprinkler chart can be used to verify this. Take a panoramic view of each span to ensure each nozzle has a good pattern and they appear to be applying the appropriate amount of water for the area they are covering. If the soil type is similar in the field, a Pivot can be run fast over dry soil and then examine how evenly it is wetted. Look for drops and sprinklers that may have been damaged during harvest or during the growing season. Drops that are severely bent will affect the pattern and overlap of the sprinkler. Examine all sprinklers in operation for the following: fixed and rotating pads are not missing from the sprinkler, rotating pads are actually rotating properly, pads do not have a build-up of materials affecting their distribution pattern, impact sprinklers are rotating properly, ensure the end gun and booster pump are operating correctly. Ensure regulators are operating properly, to make sure is not spraying out of the body. This might indicate a broken diaphragm or o-ring. The best way to check to make sure regulators are properly regulating pressure is to verify that the flow of the sprinkler matches the sprinkler chart (within 5%). Randomly select several sprinklers on each span, capture water from the sprinkler for at least 1-2 minutes in a container, measure the amount of water collected and detemine the flow rate. 2 responses to "Sprinkler package care"
Sometimes it can be difficult to match the sprinkler package with soils and field conditions. Choosing the right option is critical to achieving the potential application efficiency.